Last month, my wife and I took a 6,281 mile “jaunt” in my eighties car – a 29 1/2 year old 1985 Light Blue Metallic Chevrolet Corvette coupe. … I took the 1985 out for some miles today and I noticed some things. It’s a more tenuous feeling taking her out than it was in 2004. Of course, that was 33,000 miles ago, but the car seems more … fragile. I’m mindful of all that sweat equity (mine and many others) in it and the knowledge that it is now so … old. Less and less early C4s on the road for any reason and she’ll be thirty (!) years old in November 2014. The car judges well and drives acceptably but the problems remain present and they are a litany: the “dumb as a bag of rocks” computer, the creaks and rattles in the interior, the passenger side power window near death, the console light that keeps slowly melting the console plastic, the seats and steering wheel not far from a recovery, the repaint that is who knows how many thousands of miles out, the characteristic droops on both front and rear bumpers that will need to be fixed with the repaint. They’re known problems and they can get fixed: but some of them (seats, repaint, bumpers) will require cubic dollars. When I drive, the car feels small. All those larger and heavier vehicles around me seem to rarely look – and I have no air bags, no ABS, no traction control. Driving in heavy traffic (and there’s so much of it around Philadelphia) accentuates the feeling of fragility. I look past those lovely thin A pillars – the one’s that Dave Hill compared the C5’s to and found the C5 wanting – and I know that the C5’s are thicker and uglier because you can statically mount the car upside down on them. Those same lovely traits are repeated throughout the 1985: survival in an accident will come mostly by avoiding it in the first place. So, the overall driving experience has changed a little for the worse, though the car is in much better shape than it was when it first came off that truck. Is this a new phase or the beginning of the end? My wife’s reaction was both amazing and characteristic: “Do you still love that car?”, she said. “Yes”, I responded. “We should take it on a long trip”, she said. Lauren is not nearly as comfortable a long distance driver as our other cars, so I figured my wife would come to her senses. However, I then caught the road tripping bug and doing the Lincoln Highway seemed like a good change of pace from Route 66 (which we’ve done twice). When I brought this up as an idea, my wife readily agreed and we were on. We were on the road for a total of 15 days: one to stage to Times Square, New York City, eight to get from Times Square to Lincoln Park, San Francisco on the Lincoln Highway, six to return (really five and a half because we stopped at two museums on Friday). 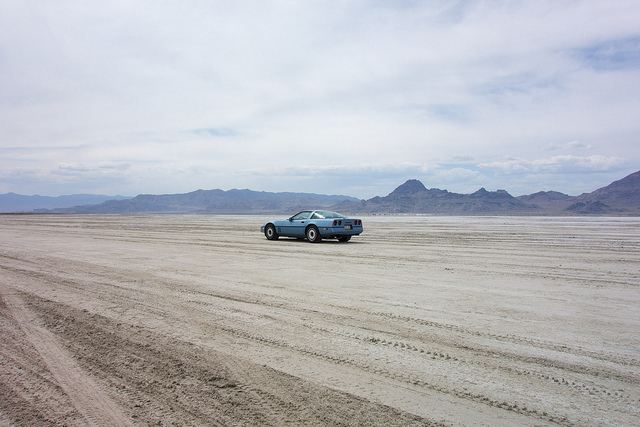 Lauren on the Bonneville Salt Flats. We ran into a hour and half traffic jam on the 280 on-ramp in Richmond, CA. Lauren was fine for the first hour and then vapor-locked (or something like it) as she overheated, causing wild surging and five (aaack!) stalls. The newly rebuilt passenger side door (less than a year old) degraded steadily (harder and harder to close) over the first part of the trip. Finally, in lonely Ely, Nevada, it would not open from the outside at a gas station. I got the door open from the inside and a 5-inch steel rod ejected violently from the door – sigh. We were able to use the manual door locks and the inside door handle for the rest of the trip, but the door will need to be fixed soon. Despite these issues, I’m really glad that I did this trip in this car.